I mentioned earlier that I would do a Trunk Club unpacking of sorts for the trunks I get each month and here she is! This is the trunk from January, so I’m a bit behind but if you guys like these I can speed up my posts so that it better coordinates with the month we are in! I ended up dropping my phone in a toilet (I’ll let you fill in whatever details of this scenario that you’d like including how I got it out of the waters…) and so I was phoneless for about a week. I won’t even lie and say that I didn’t know how attached to my phone I was until I lost it because I KNOW HOW ATTACHED I AM TO THAT THING. It’s basically my third arm in everything I do from the shop to the blog to watching pointless youtube videos in the bathtub. So I ended up borrowing my sweet husband’s to take these photos and he now has no less than 100 selfies of me on his phone. True love still exists. Thoughts: I so wanted to love this sweater and I have to say it looks 100% better in this mirror selfie than it did in person. (Or so I thought.) It was just a tad bit bulky and for that I didn’t love it. But I love the idea of it and the colors are spot on. Exactly how I want to dress this winter to spring. 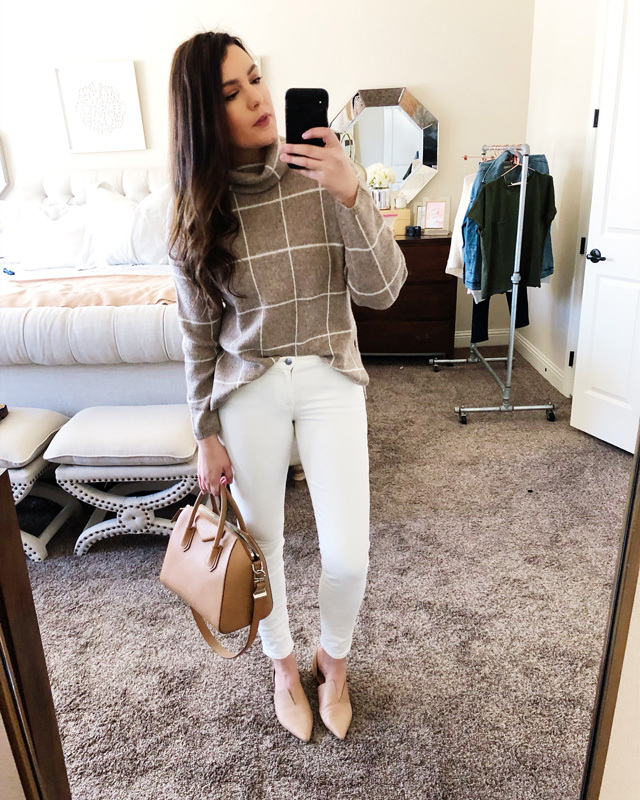 Thoughts: LOVED this sweater and kicking myself because I have the brown version of the same sweater but I like the white better! Ha! But I decided on staying with the one I already owned, but if you’re looking for a super soft sweater in ivory, this one is so nice. 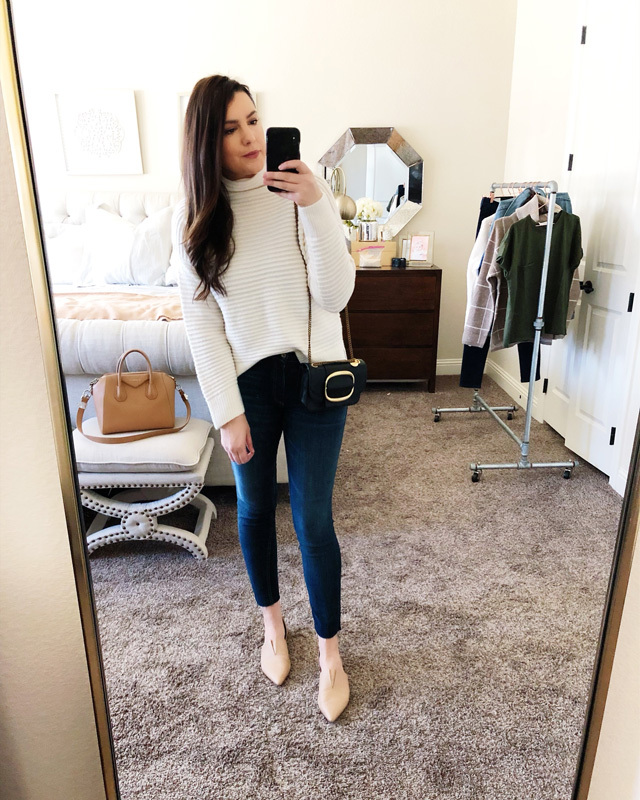 Thoughts: LOVED this sweater! I was actually going to keep it but on the day I packed up my trunk, I ended up putting this one back in. 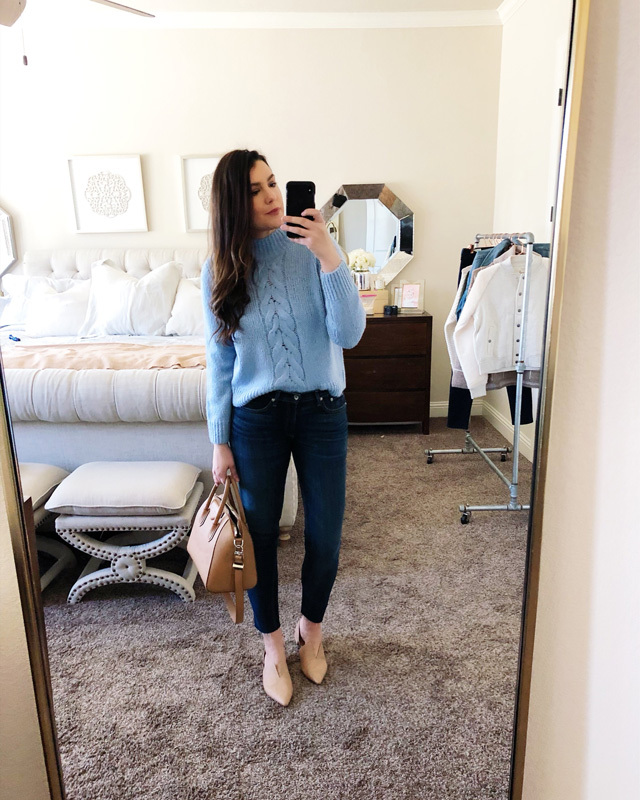 It’s so close to spring that I just can’t justify a big bulky sweater, but I loved this color and hope to find something lighter weight like this sweater this spring! Thoughts: This jacket is ADORABLE but I just couldn’t justify the price for the amount of times I know I will wear it. I love the look of it though and it was so soft and cozy. It wasn’t meant to be but I did love the look / feel. Thoughts: I loved the tee but I’ve got a lot of tees thanks to the shop! This one fit wonderfully and TTS, if you are a rag & bone tee fan! I just didn’t need it in my wardrobe right now. I need another purse like a hole in my head but I love how classic and simple this one is. It’s timeless and I like the size; it can fit my phone, my wallet and a couple of toys for Gemma. Mission accomplished. This pair of denim is more than what I’ve been spending on denim lately. It’s definitely the most expensive pair I’ve bought since postpartum and since I’ve been able to fit into other pairs of jeans, pre-pregnancy. 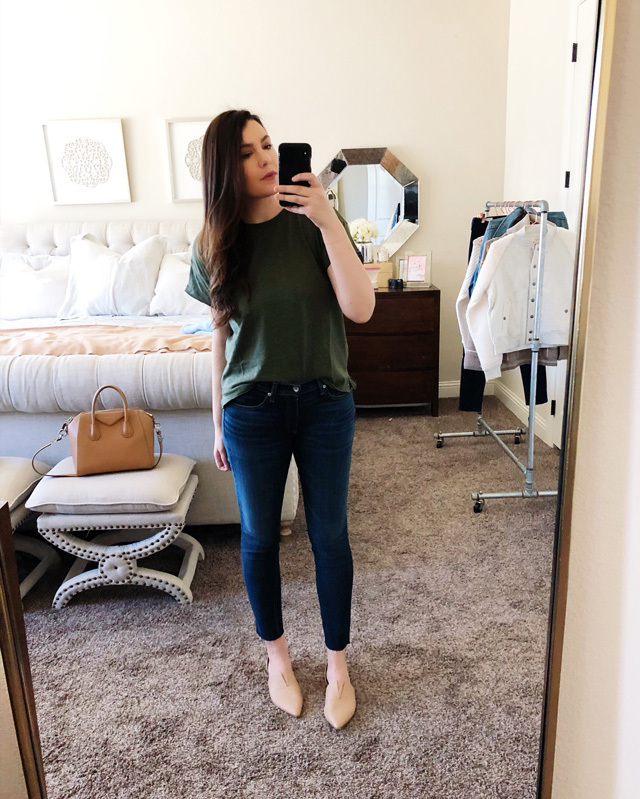 But I love the fit, they are a mid-rise and not a high-rise which is basically 90% of my denim right now and I loved the ankle length for spring. In other words, I am my own best salesperson. I do love Rag & Bone denim as it lasts for years, so I felt like these were a good buy for spring. Even though it’s still winter. Poor January, it never has a chance to even be liked because all I care about is getting through it to get to spring. Let me know if you like these types of posts! I can keep them coming! 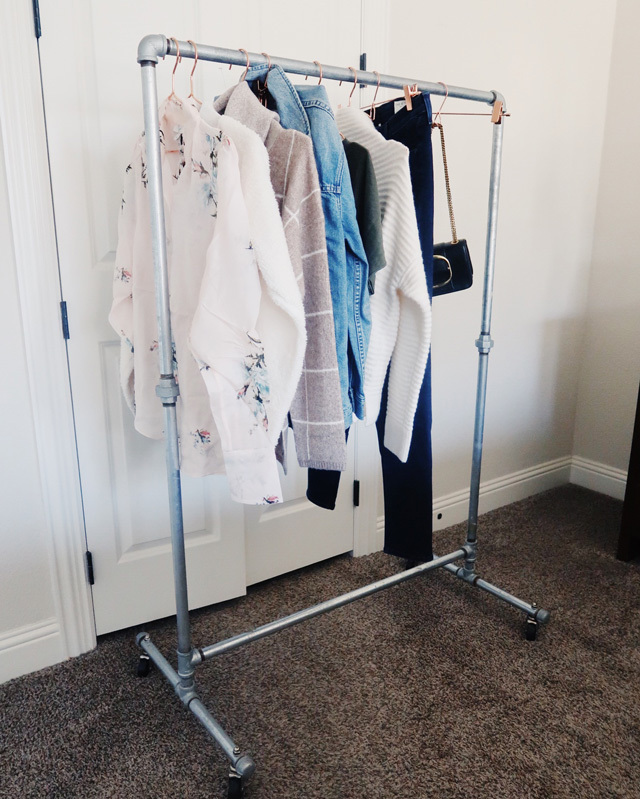 New at Everyday & Co + a Sale! TRUTH. Or picking up after said toddler 😉 I’ve never bent over so much in my life. ha! LOL. I thought about that. I can link them though! I’ll update the post with them. One was a studded sneaker for like $300 and the other was a Rebecca Minkoff Slide that was a more cowboy version of those Madewell slides I have! I think being in Texas just stops me cold for going a western route. OMG……! fall in love with this Trunk so lovely…! This collection as Denim,Rag & Bone denim and many more…..Wanna get this outfit by Valentin’s day! I love reading other people’s trunk club unboxing! I just ordered those jeans. So here’s a question. 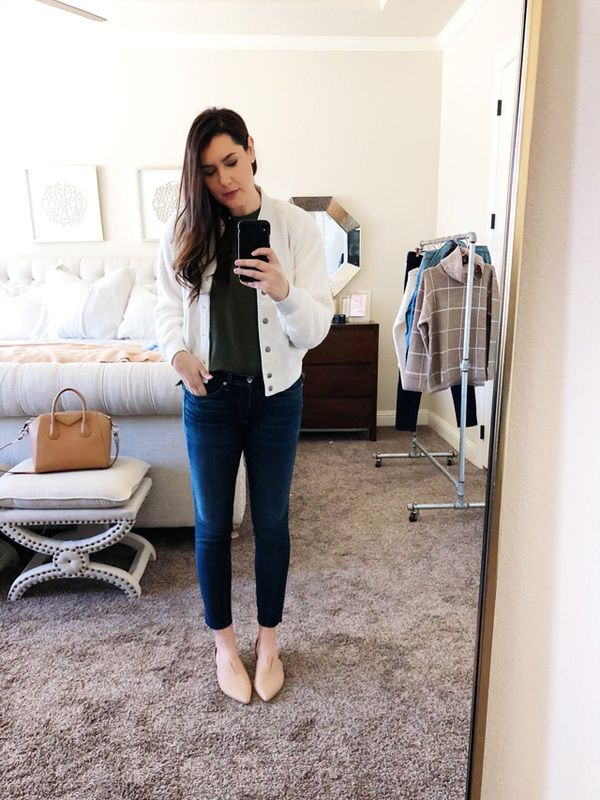 Your Vince flats… I tried them during the #NSale, thought I didn’t care for them, but you and another blogger I follow for fashion inspiration wear them a ton, and I need that color flat in my spring wardrobe. Do you recommend at full price? THANKS! Hi Jo-Lynne!! I would recommend for sure because I wear the hound of these but with a few caveats. Okay so here is the thing about these — they do get more comfortable with wear. I went down a half size to a 9.5 which is usually always true with me and Vince and they rubbed the top of my toe for a few wears and then softened. So it goes. Here is the thing — I love these babies but I do feel like they were priced for the anniversary sale. Does that make sense? I can’t remember what they were for Anniversary, maybe $150? And yes I feel good about recommending these at that price or if you have a few notes lying around, go for it! They can definitely be worn through spring and summer, truly an all season shoe. This is my third Vince flat that I own (I keep saying I’m going to go get the others re-soled and I still haven’t!) and I would say these have held up the best. So I’m on the fence, yes I love them and would probably buy them at full price if I had Nordstrom notes lol. That was a confusing answer. I do think that there will be similar shoes this spring. Have you looked in Everlane’s flats? Or Even the Gemma Mule from Madewell. 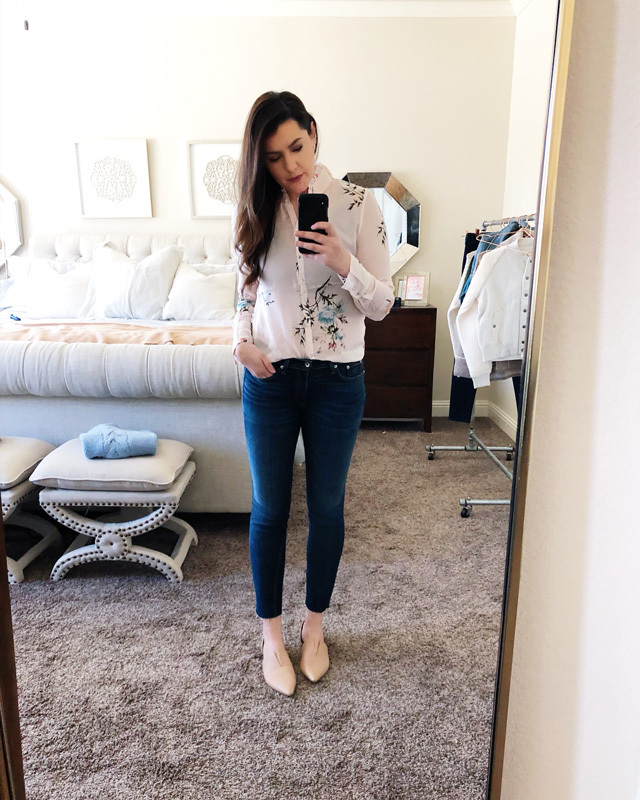 It’s not this blush color but still a good staple! Thanks so much for responding. I totally know what you mean about priced for the sale. I think I will order and see what I think. I love my other Vince shoes and these are just different enough to be fun. I have tried Madewll shoes – usually after you’ve styled them, haha! But they don’t seem to be made for my feet. I really wanted those mules to work. I should try a Everlane. been on the fence about trying it, so would enjoy more of these posts before making the plunge. In love with the first two sweaters! I found your post because I got a pair of Rag and Bone jeans in my Feb trunk as well and I was trying to find good reviews to convince myself to keep it. I did. They are so comfy and fit so well! All your outfits look fabulous! You have great style!